Earlier this year, Chilean director Sebastián Silva premiered two films at the Sundance Film Festival. The first, Crystal Fairy, was a slight and inconspicuous road movie through Silva’s native country, staring Michael Cera. The second, Magic Magic (also starring Cera, as well as Juno Temple and Emily Browning) depicted a comparable journey through Chile from the perspective of a young American, yet feels like an entirely different beast. Alicia (Temple) arrives in Santiago from California to visit her cousin Sarah (Browning), who’s currently on a student exchange programme. From here, the pair head into neighbouring Patagonia. However, when Sarah receives a call out of the blue calling her back to Santiago to apparently re-take an exam, Alicia is left to continue the journey south with just her cousin’s friends for company. As soon as Sarah leaves, the peculiar and discourteous characteristics of the group become apparent, no more so than within Brink (Cera) – whose precocious and irrational demeanour becomes the catalyst to our heroine’s disquiet. Finding herself alienated and bullied, Alicia develops problems sleeping, exacerbating her anxious state and unleashing some bizarre and unexplainable actions that begin to alarm those around her. A film full of wolves in sheep’s clothing, nobody in Silva’s latest is entirely as they seem. 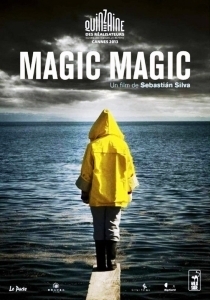 A conundrum of a film, told almost entirely from the perspective of unhinged protagonist, Magic Magic’s multi-layered narrative is a cryptic, symbolism-heavy nightmare of delusions and apparitions. Building tension through the fine cinematography of Wong Kar-wai regular Christopher Doyle, the ominous landscape of the film’s foreboding lodge successfully evokes a sense of unease. And whilst Magic Magic does perhaps feel like its been constructed to purposely confuse its audience, it still undoubtedly remains an uncomfortable watch throughout – thanks in no small part to its repugnant cast of characters. Cera excels as the sexually-aggressive yet guileless Brink, whose peculiar manner and carnal advances spark Alicia’s decent into madness. Cera’s performance is, at times, so irritating that it becomes almost impossible not to praise him for realising the role. As Alicia, Temple is clearly the star here, grasping the opportunity to delve into the psychosis of her estranged character and ultimately saving Silva’s Magic Magic from becoming an unwatchable mess of impermeable storytelling and incongruous events. By focusing entirely on Temple’s damsel in distress and failing to develop the film’s peripheral characters – neither explaining their motivations, nor questioning their curious personae – Magic Magic’s dense moral maze of supernatural nuances distances the audience from its heart. A mysterious and opaque thriller, despite boasting a stand-out performance from Temple and some technical prowess, Silva’s latest ultimately fails to offer much beyond premeditated bewilderment.